THE ALL NEW 328 COMMANDER! SPECTACULAR!! 2019 MODEL IN PRODUCTION. 2019 Sea Fox 328 Commander powered by twin Yamaha F350s with digital shift and throttle, Bahama Blue full hull color, White bootstripe, four bank battery charger, two Garmin 7616XSV touchscreen w/chirp and thru-hull transducer, Garmin closed array radar, nine cockpit blue LED lights, LED underwater lighting, T-Top underside hull color, outriggers, White painted motors, Windlass Anchor System w/controls at hem and anchor locker, side door access, 52" coffin box, JL Audio w/USB, MP3, two amplifiers, two 10" woofers, six 8" speakers, 35 gallon pressurized livewell in transom, 35 gallon livewell w/ Aquarium Window port side aft, electric toilet w/ holding tank, glass windshield, SeaStar electric power steering. The Sea Fox 328 Commander is the newest member to the Sea Fox Commander series. This 57 mile per hour beast, equipped with twin Yamaha F300s, is unbelievably agile, yet as solid as any boat on the market in its category. With its huge 10’ 8” beam and a wide Carolina flare at its bow, the 328 Commander boasts more standard features than one would expect. The Sea Fox 328 Commander is the newest member to the Sea Fox Commander series. 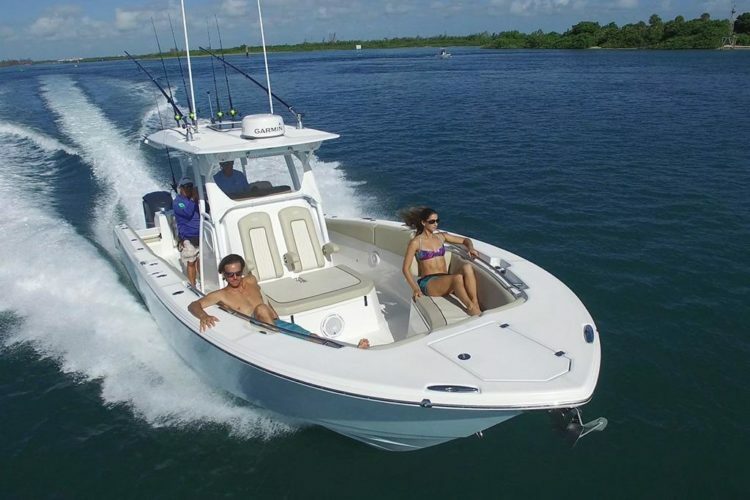 This 57 mile per hour beast, equipped with twin Yamaha F300s or F350s, is unbelievably agile, yet as solid as any boat on the market in its category. With its huge 10’ 8” beam and a wide Carolina flare at its bow, the 328 Commander boasts more standard features than one would expect.